The TS4000H Intelligent Toxic Gas Detector from General Monitors delivers accurate ammonia detection and protection, offering reliable monitoring for a variety of applications. Because of its many uses, ammonia (NH3) is one of the most highly produced inorganic chemicals worldwide. It is used in the petroleum industry to neutralize the acids in crude oil to protect equipment from corrosion and by natural gas plants as a method of NOx control. Ammonia is also used as a refrigerant in industrial refrigeration systems found in food and beverage facilities and by the fertilizer industry to produce ammonium and nitrate salts. Despite its wideapplication, NH3 is caustic and hazardous, with exposure to highconcentrations leading to lung damage and death. Exposure to gaseous ammonia is limited by the American Conference of Governmental Industrial Hygienists (ACGIH) to 15 minutes at 35 ppm and 8 hours at 25 ppm. 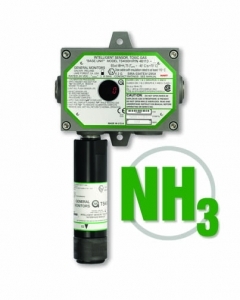 The TS4000H Toxic Gas Detector monitors ammonia in the 0-50 or 0-100 ppm ranges. Its precision electrochemical sensor has little to zero drift across its operational environmental conditions and one of the fastest responses in the market, with a T50 response of less than 15 seconds and a T90 response of less than one minute. The TS4000H measures NH3 to ±5 ppm or ±10% of reading, whichever is greater. The TS4000H features advanced functions like HART, event logging, and support of asset management software. The system also displays fault codes for troubleshooting and provides complete status to the control room. All of its electronics are contained within an explosion-proof housing so that gas sensor information can be processed at the sensor site. The gas sensor may be remote mounted up to 2,000 feet (610 metres) away from the transmitter. The TS4000H detector is easy to install and calibrates simply by activating a magnetic switch and applying gas. The interface module’s intrinsically-safe design also supports sensor field replacement without special tools or hot work permits. The TS4000H ammonia sensor helps to protect people, equipment, and the environment in abroad range of industries where ammonia leaks are a hazard. For worldwide application, the detector complies with ATEX, CSA, CE, GOST, and is certified for use in SIL 2 environments. In addition to ammonia monitoring the TS4000H can be configured to detect carbon monoxide, chlorine, chlorine dioxide, hydrogen, hydrogen chloride, hydrogen sulfide, nitric oxide, nitrogen dioxide, oxygen, ozone and sulfur dioxide.